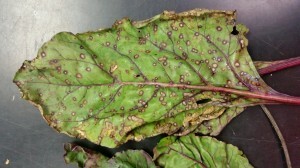 Cercospora leaf spot can significant losses in beet if not controlled properly. Cercospora leaf spot on beet. Note the round tan leaf spots with dark red margins. The fungus overwinters in soils and be a continual problem in fields with short crop rotations. It has developed resistance to important fungicides in beet production areas in the US and abroad. Resistance has been detected in the Benzimidazole fungicides (FRCA code 1); the DMI fungicides (Tilt, tebuconazole; FRAC code 3) and the strobilurin fungicides (Quadris, Cabrio, Headline; FRAC code 11). Beet growers in NJ who have relied heavily on, and are not obtaining adequate control of Cercospora with either DMI or strobilurin fungicide applications in their weekly programs should discontinue their use. These growers should switch to fungicides with different modes of action such as Fontelis (penthiopyrad, 7) at 16.0 to 30.0 fl oz/A (3 day PHI) and Merivon (fluxapyroxad + pyraclostrobin, 7 + 11) at 5.5 fl oz/A (7 day PHI). Growers who are still obtaining adequate control with either the DMI or strobilurin fungicides can continue their use, but should make efforts to incorporate the use of the mentioned fungicides above to help reduce the chances for resistance development.